Cafe Sebago in Raymond Maine is local favorite. 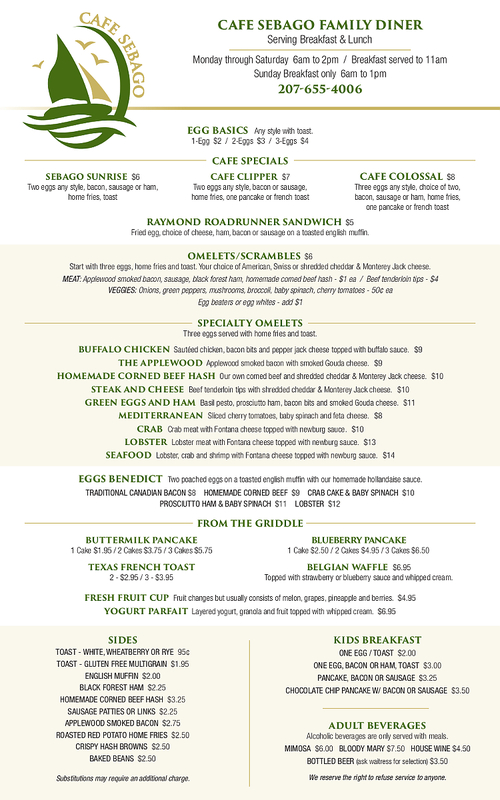 Open Year-Round, they have brand new and exciting Breakfast and Lunch & Dinner menus! Serving up classics like their delicious Lobster Roll and Stew, Chicken and Seafood platters and delicious breakfast options! Check out their menu and stop by the next time you’re in the Sebago Lake Area. Opened February 7th, 2005 by owners Bill and Kim Hines. First time here. I wish I had known how great it is!!! Mussels, lobster rolls are the BEST I've ever had!!!! Don't be fooled by the little size, it has plenty of room and great food, reasonable price. Fresh, fresh, fresh! Awesome food and terrific service!! Great place to have an awesome meal and watch a game. The food is homemade and delisious, my favorite has to be the huge lobster roll, by far the best I've had. Great prices, outstanding people, a must try.